After an introduction, pausing on the place of Creation in the Bible, this paper examines exegetically the Hebrew text of the biblical Creation story (Gen 1:1 - 2:4a), paying close attention to its sounds, rhythm, words, syntax, literary structure in relation to its parallel text (Gen 2:4b-25), and its literary genre and style, without ignoring its literary extrabiblical environment. From the given of the biblical text, the paper then addresses specific issues pertaining to the modern reader of the biblical text; the intention of the text in regard to 1) the historical-scientific nature of the information thereby provided; 2) the problem of time and the traditional proposed solutions (gap theories, critical theories); and 3) the creation of lights (the sun, the moon, and the stars). Then moving away from the debate, “creation is not evolution,” I will explore and suggest from the text, theological-philosophical lessons in regard to the “truth” of Creation, its relation to history, worship, salvation, and hope (only a summary for this presentation) and conclude on the place of Creation in the life of the believer. The importance of creation in the Bible is also notable through the pervasive presence of this reference within the Hebrew Scriptures. In the Pentateuch, it occurs in reference to the event of the Exodus (ch 15). Among the Prophets, it reappears in reference to the return from the Exile (Isaiah 40-45; Jeremiah 4:23-26; 31:35-37). It reappears in the book of Proverbs, as a reflection on the wonder of creation (Proverbs 8:22 31); in the book of Job, as a response to suffering (Job 38-41); in the Psalms, as hymns addressed to God in the context of worship (chs. 8, 33, 139, 148). In apocalyptic literature (see Daniel in every chapter), the reference or the allusion to creation is a prominent motif in relation to existence (Daniel 1) and also within the cosmic and eschatological per spective (see especially Daniel 7, 8, and 12). In the New Testament, creation also plays an important role in relation to the existential com mitment responding to God’s act of salvation and the need to become a new creation (2 Corinthians 5:17) or as the eschatological solution (Revelation 21-22). From the biblical perspective, creation is then an important topic that deserves particular attention and study. Five principles will characterize my approach to the biblical text. Considering the biblical text as an inspired text written with a high degree of intentionality, I will read the text with great care, paying attention to its Hebrew words, its syntax, its style, and observing its regularities as well as its irregularities to determine as far as possible its intended meaning. The story is first of all a written document and implies, therefore, a literary approach (“literature” means “writing”). I shall analyze its specific form, sounds, rhythm, structure, for this aspect is the first data of the text; it is a music before being a useful and meaningful message to be decoded through our mind. In the biblical world (as in ancient “primitive” Near Eastern culture) the form, the discourse that was sounded was given in relation to the spiritual or theological truth. See Martin Buber’s principle on the relation between the wie and the was. As far as possible, I will search within its immediate context or within the biblical context at large for other biblical texts that are referring or alluding to our text. This inquiry is important as it will provide us with an interpretation of the text that is closer to its original intention, not only because it belongs to the same “inspiration” (from the same divine source) but also because it is historically and culturally closer to the text. The process of intertextuality will be traced, however, with control. The connection between the referring text and our text will have to be clearly established through the use of the common association of specific key words, as far as possible a “unique” association, or even a common literary pattern (frequency, sequence, and structure). The biblical story has not been given in vitro. God has informed His servant and inspired him to make sure that he received His will, yet the story has been written by a person who belonged to his time and culture. The biblical text should also then be explored in relation (positive or negative) to its cultural environment, not only to perceive how it could have been understood at that time (“what it meant”), but also to discern where and how the biblical author situates himself in connection to the cosmological traditions he was acquainted with and referred to. The biblical creation story, just as any other biblical text, comes to us first as a “poetic” expression, a “sound and music” experience, before being a meaningful message. The observation holds in general for any text, whatever the nature of the message it may convey, whether it means truth or fiction. But it is particularly true for (ancient) Near Eastern literature. I take “poetic” here in a broad sense, as referring essentially to the form of the text: its artistic shape, the choice of words, their sound effect, the play on words, the parallelisms, the repetitions, the rhythm and the literary structure of the text — all that gives our text its effect on me physically; all that speaks to my ears, my eyes, and makes it easy to remember. The rhythm of seven runs through the whole text. Not only the story has seven steps (seven days of creation), but the rhythm affects the text internally even to the use of words. A number of key phrases are used seven times: “It was so”; “God said”; “It was good” (the seventh in v. 31 has “It was very good”). A number of keywords are used seven times or in a multiple of seven. The word bara (“create”) is used seven times; “God,” 35 times; “earth,” 21 times. Actually, the text starts with the rhythm of seven. The first verse has seven words. The second verse has 14 words. This emphasis on the number seven is meaningful. This is already a way to suggest to the reader the idea of perfection and completion. Alliterations, assonances, and onomatopoeia hit the ears and already suggest a meaning through the sounds. The first two words begin the same way with the same five consonants (alliteration): “b” “r.” The first sound of the text is an explosion: “b” — Bereshit bara. Hear the way “void” or “nothingness” is suggested through the play of sounds “o/u”: tohu wa bohu, tehom, hoshek. Hear the way the power of the wind and its movement is suggested through the words ruah merahefet. 1) Both texts are divided into seven sections; each creation work (nine in both; distributed the same way) is introduced by the same stylistic expression: in C by imperfect verb wayyomer; in C’ by the imperfect verb of the same phonetic start, wayyit, wayyts. 3) Same longitudinal correspondences: 1 parallels 4; 2 parallels 5; 3 parallels 6. 4) Parallelisms of structure between the introductions: a) temporal clause; b) parenthesis: description of the earth in a stage of “not yet,” water element; c) then divine work (“said” // “formed....”). Certainly Doukhan’s theory...has great merit. He has demon strated a degree of unity in the structure and message in Genesis 1-2 never previously established. The parallels he has pointed out between the two introductions to C and C’ are particularly strong. In addition, the parallel he describes between the two sections 7 is striking,...Thanks especially to Doukhan’s work, any reading of Genesis 1-2 as two unrelated texts juxtaposed to one another is impossible. 1) It describes an event unfolding from beginning to end; we are in time (not so in poetic fiction). The chronological intention is not only given in the text through the progression of the week, from the first day to the seventh day, but also by means of the paral lelism with the other text that clearly describes the progression of a historical event. 2) The use of the imperfect form with conversive waw, a classical form of the narrative text. 3) The repetition and the monotonous tone of the text give the impression of some kind of objective “legal” report. 2) Same lack of human life and involvement. 3) Marks the place of a turning point in salvation history. 4) Connection with the other genealogies of the book of Genesis (e.g., the blessing promised in 1:28 is realized in Genesis 5, just as the blessing promised in 9:1 is fulfilled in the genealogy of Genesis 10). 5) Specifically designated at the end by the technical term toledoth (“genealogy”), a term which is usually associated with the genealogies of biblical lives. The biblical creation story is not just embedded in the context of the book of Genesis and the Bible; it is also situated in the context of its Near Eastern cultural environment. The biblical author is very well aware of the cultural world around him and of its mythological cosmogonies to which he responds in a definite polemic manner. The sun and the moon (1:15) are not given their usual names, šemeš and yareah, which may confuse them with shamash, “the sun god,” and yarih, “the moon god.” Instead, they are called meor, a word that is always used in the Pentateuch to designate lamps (Exodus 25:6; 27:20; 35:8, 14; 39:37; Leviticus 24:2; Numbers 4:9, 16). The sun and the moon are just vulgar lamps. It is noteworthy that the technical verb bara (“create”) is associated only with three creations: the general creation of heaven and earth (Genesis 1:1); the creation of human beings (Genesis 1:27), and the creation of the great fish (Genesis 1:21). Why the fish? To emphasize the non-divine nature of this animal which was worshiped as a god in both Babylonian and Egyptian religions. The big fish of the ancient cos mogonies is just an ordinary fish for Genesis. In the Genesis creation story, the water of the Introduction (Gene sis 1:2) is associated with darkness, tohu wa bohu (idea of “emptiness”), tehom (idea of “deep abyss”), in order to counteract the ideas promoted in Babylonian and Egyptian cosmogonies that viewed the primeval waters as the living god who generates the world (Nun in Egypt and Tiamat in Babylon). These waters are, therefore, qualified in the immediate context of the biblical creation story in negative terms in relation to darkness and emptiness. This lesson is again confirmed through the parallelism with the other creation story. The description of Earth’s condition before God’s first word of creation that is given as a watery element in Genesis 1:1-2 parallels the description of Earth’s state in Genesis 2:4b-6 that is given in terms of “not yet” and “not” (of course, here from the particular per spective of the sixth day). This does not mean, however, that the author is thinking of symbolic water. He may well be referring to real water, an element that might have been created before this creation week; the text does not speak about it, nor does it say when or how this element might have been created. Yet the author’s concern is not so much water per se; again, he is not dealing with the creation or the chemical description of water as such. His specific concern is rather to deny the mythological view that the “primeval water” (a concept that is common in all the Near Eastern world) was a divine agent of life. For the biblical author, life was distinct from and outside of water: “The spirit of God was hovering over the face of the waters” (Genesis 1:2). What you see as a living divine being producer of life, says Genesis, is just water, a “neutral” element associated with darkness, emptiness, and nothingness. Life comes from elsewhere: God. The Genesis creation story is not performed from any already existing divine substance, His blood, sperm, or saliva, as is the case in other ancient cosmogonies (Egyptian and Babylonian). It is not an ex-divino creation. Neither is it the result of a struggle between already existing gods — as is the case in Egyptian cosmogony where the sun god Re fights the ocean god Nun or in Babylonian cosmogony where Marduk, the god of order, struggles against Tiamat, the divine fish of water. God creates out of something which is neither Himself nor something or someone else. He creates through His word, ex-nihilo. Also the fact that the creation story is a genealogy betrays the author’s concern to provide a polemic against the mythical idea of divine pro creation. It is, indeed, significant that our biblical genealogy is to tell us that creation did not take place as the result of some kind of sexual pro creation; it is instead the creative act of a God who precedes and determines the power of giving life. 1) Dependent temporal clause: general introduction, reference to heaven and earth. 2) Parenthetic clause: description of earth at the stage of “not yet,” water element. 1) In the beginning of creation...of heavens and earth. 2) As the earth was tohu wa-bohu; and darkness was on the face of the abyss (tehom), and the spirit of God was hovering on the face of waters. 3) Then God said: “let there be light!...” (Genesis 1:1-3). 2) “...did not exist” or “there were not yet struggles...” Description of the pre-created state of the earth as a water element (see above). 3) Then divine act of creation. “Bildad the Shuhite answered and said: ‘How long till you put an end to words?’” (vv. 1-2). (Bildad will then argue that Job must be a wicked man [v. 5], “Who does not know God” [v. 21], since he is suffering [vv. 7, 12-19]). “Then Job answered and said: ‘How long will you torment...with words?’” (Job 19:1-2). Job then proceeds to refute Bildad; and by the end of his plea, he starts over on the motif “words”: while Bildad wishes the end of Job’s words, Job wishes that his words will be inscribed, engraved, on a rock forever (vv. 23-24); and then responding to Bildad’s charge that he does not know God, Job repeats the same word to affirm, “For I know” (v. 25) and again at the end of his discourse, “that you may know judgment” (19:29). To be sure, the parallels are not perfect, the introduction of the polemic texts does not exactly duplicate the text it responds to. There are many important differences that should not be overlooked. Yet the parallels between the introductions of the Genesis creation story and those of the ancient Near Eastern texts, just as between the introduction of Job’s speech and Bildad’s, are significant enough to suggest that they are intended for polemic purposes. From the data provided by the form of the text, its genre, and the way it situates itself within its own cultural environment, we may now be able to interrogate the text in regard to specific issues that are the concern of the modern reader. Often we detach “creation” from this historical context and consider it as a separate “doctrine” (which happens usually in discussions of the relation between science and religion). But this violates the intention of the creation stories. They want to speak to us primarily about history. Accordingly, the greatest weight must be given to the form of these stories: they are “historical accounts” and, as such, are part of the historical narration. Another lesson of this connection is to draw our attention to the “not yet” condition of this creation in comparison to the actual present con dition of the human world. Already this observation about the goodness and perfection of creation was repeated over and over again in the first creation story through the rhythm of seven: “It was good.” Now the connection with Genesis 2:4b-25 is more specific. Not only was creation good, perfect, and complete, but it was not yet touched by evil, sin, and death. This is the main lesson of the story contained in the second creation story. Man has not yet sinned and death has not yet come (Genesis 2:6-7). And this lesson is not just at the core of the story, it appears in the intro duction and the conclusion of our text as an inclusio, a literary device to notify the reader that this is intended to be the central idea of the passage. In the introduction (Genesis 2:5), the keywords are “not” (ayin and lo) and “not yet” (terem; twice), suggesting the perspective of the writer. What characterizes this world of ours was “not yet” there when God created it. In the conclusion (Genesis 2:25), the play on words between arom (“naked”) and the arom (“cunning”) of the serpent which comes in the next verse (Genesis 3:1) betrays the intention of the author to imply that the tragedy which will later involve the serpent and human beings has not yet struck. It has been identified as a “prolepsis pointing forward to Gen 3:7.” Indeed, one of the intentions of the function of this chapter 2 is to affirm and emphasize the perfect state of creation as it came from the hand of God and not yet affected by evil, sin, and death. The fact that our text has been written with a strong polemic intention directed against mythological material suggests the author’s intention to affirm the independence of his inspiration. His account is not the mere product of folk imagination and memory; it is not a myth, but it is instead a historical event which belongs to the process of revelation. This strong polemic intention does not mean, however, that the bibli cal author was determined by his polemic and shaped his whole account under its pressure, thus affecting the content of his report. The very fact that after the introduction the parallels and the polemic hints become only sporadic and accidental, touching only on specific words or motifs, and never again recur through a consistent literary sequence is a strong indication to the contrary. Indeed the biblical author not only meant to respond to his eventual disputants, but he wanted to take us to a direction altogether different that would have nothing to do with the contemporary confrontation. In fact, the very reason of the polemic itself, namely its anti mythological purposes, should have prevented this confusion to happen. Indeed in ancient mythological literature, the message (poetic or philo sophical) does not necessarily depend on the historical actuality of the story that conveys it. In the myth of the cave, Plato explains that in order to have access to the truth, we must get out of the sensible reality. In order to represent a metaphysical or theological reality, the platonic symbol resorts then to a chimere, or an allegory borrowed from the non real. The message is disincarnate. The flesh of history is unable to carry the spiritual truth. In mythological material, as it is in Greek thinking, thought precedes the event of the story and does not depend on its actuality to be true. On the contrary, the Hebrew uses historical reality to signify the spiritual truth. Apart from that reality, truth does not exist. In Hebrew thinking, it is the event that precedes the categories of thought. It is the event that makes theology; that is theology. The Hebrew author of the creation story was then more concerned with reporting the event than with teaching a theological thesis or even refuting different opinions and theological errors. The biblical anti-mythological polemic is more than an apologetic argument, thus standing and even existing negatively versus the other, being what the other is not. Precisely because it intends to testify about an event, the biblical testimony is presented as existing by itself. For that reason, the biblical story is to be read respectfully, taking into consider ation the presented data as it stands, not as a story referring to an event for theological purposes (mythological material), but rather as a testimony that describes the content of that event as well as the way it develops its course, including the sequence of its components. This is why if we use the same method for the biblical text as for traditional mythological litera ture (e.g., historical-critical interpretations) and despise the historical intention of the biblical text, we may then run the risk to be at odds with the biblical text and totally miss the point. The fact that our text has been cast in the mold of genealogy and explicitly identified as such suggests the author’s intention to communi cate his information as material enrooted in the flesh of history. Genealogy is, indeed, in the ancient Near East and in the Bible the most tangible evidence of historical existence. Also by using the term toledoth for the creation of heaven and earth, as well as for the genealogy of the patriarchs, the author shows his intention to relate his story to the history of mankind, an intention which has been understood by the Jews who express this unity of creation and history by dating their calendar from the creation of the world. Now, the fact that the text presents itself as a genealogy indicates also its limitations: the text does not claim to be scientific. It simply testifies that the event took place, but does not explain how it worked scientifically. We do not have all the ingredients disclosing the mechanism of creation. Just as for the genealogy everything is correct but not the whole data is given. Regarding the nature of the days of the creation week, the text is quite clear and explicit. The text does not imply that they are symbolic or cosmic, but it gives us enough clues about the author’s intention to refer to days that are of the same temporal nature as our human days. The first observation concerning these days is that they are explicitly qualified with the same composition: they have “evening and morning.” Such a cyclical light-darkness arrangement clearly means that the earth was now rotating on its axis with a source of light on one side of the earth (although the sun was not yet operating). The length of such days was that of a normal solar day. In no way could the term apply to large periods of time (a geological or symbolic period). Otherwise, it would imply regular long periods of darkness, a condition that would have made im possible the survival of life. It is also significant that the Sabbath, the seventh day, is the only day that does not have the mention of “evening and morning.” The reason for this exceptional omission is that this is the only real full day of the creation week when humans are present. Although humans are present on the sixth day, which is also qualified with the expression “evening and morning,” the fact that they have been created within the day implies, indeed, that only the seventh day was their first and only full day of the creation week. Only the seventh day was the day they experienced totally, from sunset to sunset. For this day, we do not need, therefore, the specification “evening and morning.” For the other six days, on the other hand, humans are totally or at least partially absent, and therefore the author feels necessary to specify “evening and morning” to make it clear and emphasize that these days are of the same nature as our human days. The way the first day is called in comparison with the other days seems also to carry some significance. This is the only day that is indicated with a cardinal number, yom ahad, “day one” (instead of first day). All the other days are called with ordinal number: “second day,” “third day,” etc. It is as if the author wished to set the time and notify us from the start about the nature of these days. The phrase yom ahad means literally “day absolutely unique.” The same word is used for God in the shema (Deuteronomy 6:4) to emphasize God’s absolute uniqueness. In fact, the phrase yom ahad is always used in the Bible to refer to days of 24 hours and never to any other period of time. The fact that the week of creation starts with this specification about the first day not only suggests that all the days of this week are like the first day, “unique days” (not periods implying several days), but also prevents us from interpreting these days as only referring to the order of creation. Two main problems are associated with the creation of the lumi naries in the creation story: How were the first three days monitored since the sun and the moon only appear on the fourth day? What does the creation of the luminaries on the fourth day mean in the creation story? The solution to the former problem is suggested in the connection that is intended by the text between the creation of the lights on the fourth day and the creation of light on the first day. This connection is indicated not only by the structure of the creation story (see above the longitudinal correspondence of day one related to day four, etc. ), but also through specific echos and parallels. This parallel between the two functions suggests that what is being performed by the luminaries on the fourth day is taken care of by God Himself from the first day. The days before the fourth day are thus of the same nature as the days ruled by the sun and the moon. The solution to the second problem about the creation of the lumi naries is implied in the language used to describe that creation. There is one important difference, indeed, between the creation of light on the first day and the creation of the luminaries on the fourth day. The creation on the first day concerns the creation of light per se: “let there be light...” (v. 3). The yehi (“let there be”) is syntactically related to havedil (“divide”) by the means of the preposition lamed. In the fourth day of creation, the luminaries are never given by themselves. Their creation always applies to the function of the luminaries. Yehi is always related to their various functions (“divide,” “rule,” “give light”; vv. 14-17). This syntactical form is unique in the creation story. The contrast between this description of the division (between light and darkness) on the fourth day and the description of the division between the waters in relation to the creation of the firmament on the second day is particularly instructive. Contrary to what takes place for the sun and the moon, the creation of the firmament is decomposed in two distinct and consecutive operations (with no syntactical relation): 1) the creation of the firmament per se (vv. 6a, 7a), and then 2) the creation of its function of division between the waters (vv. 6b, 7b). The syntax of the passage indicates a difference between the two objects of creation. While there is a yehi (“let there be”) applying to the firmament and another yehi applying to the function of dividing; for the sun and the moon, there is one common yehi that is syntactically related to the verb and not to the noun object (the sun and the moon). From this difference of language it is clear that the author is not referring to the creation of the luminaries (sun and moon), but rather to their function. This observation suggests at least that those luminaries were already created before the fourth day of the creation week. Whether this operation took place on the first day or even before the creation week, the text does not say. As for the stars in v. 16, they are only mentioned as extra infor mation, like some kind of appendix, as if they were not directly relevant to the matter. It is for instance remarkable that the verb “made” (’sh) is not repeated in relation to the “apparition” of the stars. A literal translation of the passage will give the following: “And God made (’sh) the big luminaries, the bigger luminary and the smaller luminary; the bigger luminary to rule the day, and the smaller luminary to rule the night, in addition to the stars.” It is noteworthy that the function of the stars is not explicitly given. In fact, it is only the function of the two luminaries that is given. This omission about the function of the stars may be explained in two ways. Either the function of the stars is the same as the one of the two luminaries, in which case they are also included under the term meorot (“luminaries”); it is not clear then why this particular syntax. Or, the function of the stars is different from that of the sun and the moon, a function that has nothing to do with the earth; in which case they are not among the meorot (“luminaries”), but then why mention them since they are irrelevant to our system? It seems to me that this particular syntax that exceptionally omits the reference to the function of the stars could very well pertain to the polemic concern associated with the sun and the moon. Since the sun and the moon are not explicitly identified with their technical names shemesh and yareah, they are only vaguely identified as “greater light” and “lesser light,” the biblical author feels necessary to specify their function in order to make it clear that he is referring to the sun and the moon. On the other hand, the stars are designated under their usual technical name kokhavim; and, therefore, there is no need to characterize these through their function, since this is already implied in their explicit designation. In fact, they have their place in the same cosmic function; in biblical tradition the stars are, indeed, associated with the moon in the ruling of the night (see Psalm 136:9 where the stars and the moon are associated in the ruling of the night within a context referring to the creation story). 1) Critical scholars in general have interpreted the biblical text as poetry or a hymn containing imaginary mythological material and therefore irrelevant to history and science. I have already responded to that argument (see above). 2) Conservative scholars in general have been keen to reconcile the apparent scientific need for a long time with their faith in biblical revelation; they have therefore introduced into the biblical text the idea of a pre-creation which would have taken place billions of years before the biblical week of creation. This theory has been called “gap theory”. It suggests that Genesis 1:1 refers to this pre-creation, then v. 2 describes the world empty and void for billions of years (gap), and then v. 3 starts the new creation, formation, furnishing of this empty space for one week. From my perspective, this whole idea of “gap theory” raises serious philosophical/theological problems and more importantly cannot seriously be defended exegetically. This does not exclude the possibility that God may have created something before (including for instance water, or stars); this creation, however, is not the point of our creation story that speaks only about what took place during the first creation week. I will essentially focus here on the exegetical argument from the text. In my view, the syntax and the literary structure of the introduction of the biblical creation story (Genesis 1:1-2) hardly supports any kind of gap theory (active or passive). The following reasons justify my resistance. From the outset, it is, indeed, remarkable that the introduction (Gene sis 1:1) and the conclusion (Genesis 2:4a) echo each other as an inclusio using exactly the same language bara (“create”) shamayim (“heaven”) waarets (“and the earth”). Since the conclusion refers to what takes place during the creation week, it follows that the introduction refers also to the same work of creation and not to another probable pre-creation. 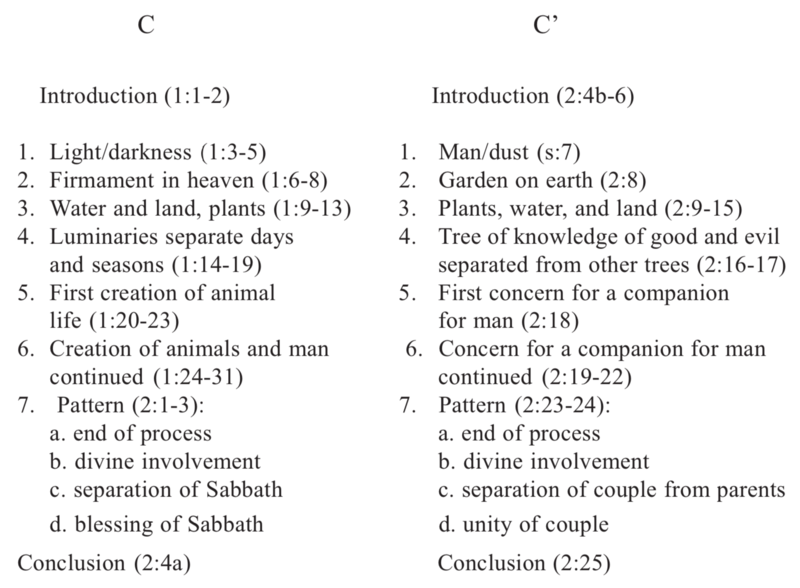 The parallelism of structure between the two introductions (Genesis 1:1-2 and Genesis 2:4b-6) suggests that just as the second creation story reads in one breath with no gap inside, the first creation story should imply the same one-breath reading (same reasoning in regard to the parallel with the Babylonian creation story). 1) The parallel of structure with Genesis 2:4b-6 and the Babylonian creation story. 2) The great majority of occurrences of (be)reshit (49 out of 50) are construct cases. 3) The fact that Proverbs 8:22-35 which clearly refers to our creation story thematically and structurally (see its seven sections corres ponding to the seven sections of the creation story) uses reshit in the construct form (8:22). 5) The observation that if the author really meant an absolute case he should have used it with the article (bareshit instead of bereshit), a form that is attested in Nehemiah 12:44 (see also the Samaritan version on Genesis 1:1). 6) This reading “in one breath” is the one received in Jewish tradition (see especially Ibn Ezra and Rashi in Miqraoth Gdoloth) which never heard about the Enuma Elish account. It is clear to me then that the biblical text does not imply any kind of gap theory. The biblical text leaves us with the problem of time. For the intention of the text is clear: God created all the human cosmos (heaven and earth) during this first week. The text means to tell us that everything, “all” (emphasis on the seventh day), has been created during the first week and says nothing about a pre-creation. Otherwise why rest on the seventh day? The celebration on the seventh day would lose its raison d’être, as the culmination, the conclusion, of the whole process of creation at the seventh step, a number which marks the climax only if it implies the work was limited to six days and not if it also implies several additional billions of years before that week. In fact, as Exodus 20:11 says, “In six days the Lord made the heavens and the earth, the sea, and all that is in them.” The commandment does not suggest either that the biblical creation story was also concerned with some kind of pre-creation. Instead, it clearly states that everything was created by God during six days and therefore enjoins mankind at the end of these six days to join God in His holy rest, as a celebration and a commemoration to mark the conclusion of the creation week. The dilemma is not so dramatic for the holder of the “passive gap theory,” but it still carries and raises the same problems. If the creation ex-nihilo, the creation of original matter, the creation of heaven and earth took place billions of years ago, why is the last day of this creation given as the seventh day of the same creation of heaven and earth (Genesis 2:1-2)? I do not think either that the text allows for the idea of the creation of matter in vv. 1-2 during the first night as a part of the creation on the first day, that is, before the creation of light in v. 3. For the Hebrew day implies both night and day. The words ereb and boqer do not imply two distinct periods of time (night and day) but represent the two extremes of the time of the day to imply the totality of the day (merismus). Light or day as well as darkness or night belong to this first day of creation. And yet the biblical creation story is not unaware of the problem of time and suggests a connection through its connection with its parallel text. The fact that in the text of Genesis 2:4b-25 man, the garden, the trees, etc., are given as a “finished” “mature” creation may suggest a key for the problem of time implied in Genesis 1:1-2:4a. The miracle of this “compression” of time for the creation of man and his immediate environ ment (as described in the second creation story and also attested in the first on the sixth day of the creation week) makes possible the idea of the other miracle of compression of time for the cosmic creation (matter, rock, light, the firmament, the earth). Of course, this solution is hypothetical. Could it be otherwise? After all we are concerned with the divine work of creation. But at least this parallel of thinking is allowed by the creation story through its connection with its parallel text. Certainly this option is one of faith. Scientifically, reasonably, time is a necessary factor to produce a mature earth, but is it not the same for the creation of man? If we have the faith to believe that God could “by-pass” time for the creation of man and his environment, we can have faith for the other creation. After all, whatever we do, whether we allow for more or less time, the problem of time will always remain as real and acute anyway. From the perspective of faith, the solution is easy. From a scientific perspective, it remains to be explored whether or not this idea of compression of time is a possible option. Indeed, the affirmation of creation pertains to both faith and science. Both perspectives are then needed in that discussion. There is merit and justification for a strong and deep conviction about the event of creation, for only faith can make justice of this event, since no humans were present or involved in that operation. There is also merit in showing the weak nesses and the limitations of evolution as a scientific option or a philo sophical thesis; for we live in a critical world and only a rigorous and serious intellectual defense will make our faith in creation a reasonable position. But I think our testimony should take us beyond the dogmatic faith or the apologetic argumentation (without abandoning either one), to adopt a more positive stance and to explore further and discover the meaning, the beauty, and the depth of the biblical truth of creation, and eventually think creatively on creation. For creation is more than a re vealed truth to be imposed “by faith” on the faithful believer; more than an argument against evolution to be proved “by reasoning” to the un believer. Creation is life itself.
. On the theological significance of this literary observation of “beginning and end in the Bible,” see especially: Westermann C. 1972. Beginning and end in the Bible, translated by K Crim. Philadelphia, PA: Fortress Press.
. See: Doukhan J. 1993. Allusions à la création dans le livre de Daniel: Dépistage et Significations. In van der Woude AS, editor. The Book of Daniel in the Light of New Findings. Leuven, Belgium: Leuven University Press, p 285-292.
. Buber M. 1964. Schriften zur Bibel, vol. 2 of Werke. Munich: Kösel Verlag; Heidelberg: Verlag Lambert Schneider GmbH, p 1112.
. A simplified transliteration has been used in this paper to facilitate its reading and to accommodate the non-technical eyes of lay readers.
. Doukhan JB. 1978. The Genesis Creation Story: its literary structure. Andrews University Seminary Doctoral Dissertation Series, vol. 5. Berrien Springs, MI: Andrews University Press, p 78-79.
. Garrett DA. 1991. Rethinking Genesis: the sources and authorship of the first book of the Pentateuch. Grand Rapids, MI: Baker Book House, p 195.
. Albright WF. 1957. The Refrain ‘And God saw kî tôb’ in Genesis. In: Mélanges bibliques rédigés en l’honneur de André Robert. Travaux de l’Institut Catholique de Paris 4. Paris: Bloud & Gay, p 26.
. See: Westermann C. 1966. Genesis. Neukirchen: Neukirchener Verlag, p 22.
. Hornung E. 1996. L’Esprit du temps des pharaons. Philippe Lebaud Editeur/Editions du Félin, p 34, 35. .Lichtheim M. 1973. Ancient Egyptian literature. Berkeley and San Francisco: University of California Press, Vol 1, p 106. .Chassinat E. 1892-1897. Le Temple d’Edfou. Paris: Mémoires de la mission archéologique française, Vol 6, p 4, 16. .Pritchard JB, editor. 1969. Ancient Near Eastern texts relating to the Old Testament. Third ed. Princeton, NJ: Princeton University Press, p 4-6. .Anderson BW, 1967. Creation versus chaos: the reinterpretation of mythical symbolism in the Bible. New York: Associated Press, p 33. .Walsh JT. 1977. Genesis 2:4b-3:24: a synchronic approach. Journal of Biblical Literature (1977):164. .The same connection is attested in John 1:1 in a context that is consciously reminiscent of the text of the Genesis creation story. Although the Gospel of John does use the phrase “in the beginning” as an independent clause, following the Septuagint of Genesis 1:1, it also relates the word “beginning” to the word of God — “In the beginning was the word” (John 1:1).